Gear up for some intense action and epic battles this holiday season with the new Call of Duty: Infinite Warfare Bundle, available next week for $299.99 USD / $379.99 CAD (MSRP)*. 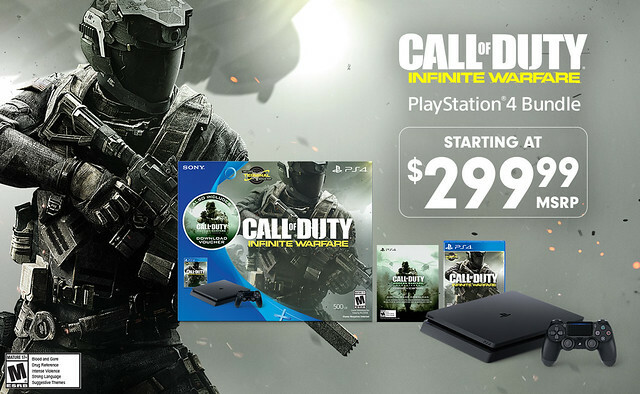 This special bundle features the new slim 500GB PS4, a Call of Duty: Infinite Warfare Blu-ray disc, and a Call of Duty: Modern Warfare Remastered download voucher. This bundle is great for fans who have not yet experienced the grand-scale intergalactic battles of Infinite Warfare. It’s also a fantastic opportunity to relive the iconic campaigns of one of the most critically-acclaimed games in Call of Duty history, with Modern Warfare Remastered. The bundle also comes with a Terminal Bonus Map, which transports players to the re-imagined version of the fan-favorite Terminal map from Modern Warfare 2. Also, if you own a PlayStation VR system, the Call of Duty: Infinite Warfare Jackal Assault VR Experience is available as a free download via PlayStation Store. This is for everyone who owns a PS4 and PS VR — not just for those who already own Infinite Warfare. The Call of Duty: Infinite Warfare Bundle is an awesome addition to the PS4 hardware lineup, and is another great reason to join the PS4 Community. With an incredible lineup of games coming in 2017, now is the time to get that PS4 you’ve always wanted. Happy holidays, and see you online! *Only available at select retailers in Canada. I’m loving the new PS4 (slim). For my non 4K TV, it is all I need, and it runs a lot quieter than my launch PS4. Very cool, but I can’t help but ask the obvious question; why didn’t this go on sale 2 weeks ago? Would have been a bigger win for everyone involved. I’ve known since last week that there was a new bundle coming, street dated for the 26th, but i didn’t know what game would be bundled. I guess it should’ve been obvious it’d be Call of Duty huh? @Squint – Probably because Infinite Warfare is only a month old and having that new bundle come out and be immediately marked down to $250 wouldn’t make sense on Activision or Sonys part. They can do that with the Uncharted one because it’s been out for a good while now and Sony owns the IP. @shadysaiyanz: Ahh, that makes sense. I had it in my head that the game came out in early October. Considering you need to Infinite Warfare disc to play it I’m not so sure. Interesting decision. I would have thought trying to bring down the PS4 Slim price as much as possible would have been the way to go. A PS4 Slim with no game for $249.99 or even $199.99 come E3 would give the lowest point of entry possible, bring the slim into impulse by territory. It seems it would make more sense to push the Pro with bundles, to get more customers paying attention to the premium product, and help give developers incentive to put efforts behind it. I am very interested to see how things play out over the next year. This bundle should help push PS4 very well post christmas, and thru Q1 (Sony Q4), but I don’t know if it is the best move in the long run. Hopefull we will see more push for the Pro as the year progresses and the idea of muitple console specs during a generation sets in. I’m hoping for a Pro bundle and a VR bundle by the end of March. Want to get both, and replace my original PS4.